The death of Iain M Banks today, at the age of 59, has rocked the literary world, who loved him equally for his science fiction as for his more general fiction. The death of a young personality is always shocking, but sadly not increasing in rarity, and will particularly resonate not only with his fans but also with anyone who is of this age themselves or has a close relative of this age, as they are confronted with mortality on a closer level (as someone in their mid-twenties with a father in his mid-fifties, I cannot imagine losing my father at this age - and yet I know those who have lost theirs at this age, and even younger). However, to lose a personality with such universal appeal is perhaps even rarer. Banks was a writer of extraordinary breadth, covering dystopia, crime, economic crisis, materialism, terrorism, war, substance abuse, God, science, dreams and more - and all with a touch of irreverence and wit. Unsurprisingly, he also covered the subject of death, and was set to do so again in The Quarry, which will be released in June 2013. 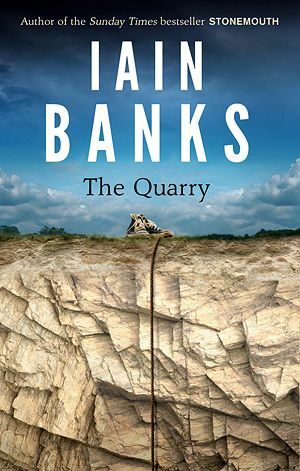 Despite Banks' pleas to his publishers to bring the release date forward in the hope that he would see The Quarry's publication, his terminal cancer diagnosis was unsparing and all-pervasive. A sixth sense perhaps lured him to begin his final novel - which, ironically, has a hero dying of cancer, even though Banks was unaware of his own diagnosis until he was 10,000 words off finishing The Quarry. In it, he appears to have broadened his horizons yet again as a swan-song, this time featuring a young narrator on the autistic spectrum whose father is staring death in the face thanks to the Big C. Given my interest in both fictional and non-fictional books based on autism, and particular Asperger's Syndrome, I await the publication of The Quarry with bated breath - not only to indulge personal interest, but also to see Banks' final masterstroke. So what do fans treasure as Iain Banks' legacy? A quick sweep of his website proves that they prize his imagination, innovation, humour, ability to apply himself to whatever genre he chose, energy and intelligence. Perhaps most importantly, his "[refusal] to allow his fame and success to compromise his principles" is something that we can all take as an example - not just great writers. However, in the pattern of so many great writers, Banks will perhaps achieve even greater fame after death, with his work reaching even more readers. I know I'll be there buying The Quarry in June - and looking into even more of his other books too.